We've been looking at creating a Fairtrade Stormhoek wine, but been struggling with what we see as a disconnect between the market and the ideal. Fair Trade is very much the hot ticket these days, all of big UK retailers are in pursuit and it seems to be a moral imperative that retailers stock more of the stuff. For those who don’t know, Fair Trade is a certification assuring that workers or growers of certain products and commodities are treated and paid fairly. The idea is a good one especially for small growers of commodities such as coffee and cocoa where world commodity prices fluctuate wildly with the bottom of the market being below the actual growing costs. The Fairtrade certification sets floors to these prices which assures that these growers can earn a living. For wine, tea and other ‘estate’ products, Fairtrade guarantees that the owner of the property is paying fair wages and providing good working conditions. In any case, Fairtrade is about passing more money to the laborers and ensuring that they are treated in accordance with set standards. And as we explore the possibilities, we see that exercise of 'trading fairly' is one where all of the parties in the value chain must share the responsibility. It is obvious that "Fairtrade" does equal higher cost and any objective observer will ask: Where is this extra money supposed to come from? Retailers must deal with the vagaries of consumer demand and while the large grocers are interested in supporting good causes and showing that they care about the community, stakeholders and suppliers, they will balk at selling something for more money that the equivalent non “Fairtrade” wine. So, if there is no more money in the retail price, and we assume that the grocers work on standard profit margin, the UK government takes their customary 16.06 pounds per dozen in duty, plus 17.5% VAT and the EU takes the approximately E1.20 per dozen, then where is extra to pay workers coming from? Where in the value chain is the “Fair” coming from. It is not in the producers’ budgets as already it was recently reported that 80% of all wineries do not make money- and we can attest to the fact that it is very difficult to make money in the business- not to mention that the UK/EU government takes more of the value of an average bottle of wine than the winery receives. So, if we are all not going to be intellectually dishonest, then everyone who is involved in the business must agree to “Fairly” contribute to the value chain. 1)	The Consumer must become a ‘stakeholder’ by being willing to pay a reasonable supplement to the normal cost of the wine. Even if this is 10p a bottle, it provides tangiable meaning to what will otherwise inevitably become a meaningless term. 2)	Fairtrade, unlike the term ‘organic’ must not be used to as emotional blackmail to guilt the consumer into spending more than the wine is reasonably worth. 3)	The retailer and importer must contribute to the Fair Value Chain by being willing to contribute some portion of the ‘normal margin’ to the benefit of the workers. This is essentially paying a bit more and reducing margin, even if it is a few percent. 4)	Wineries must pass the extra proceeds from above to the workers in accordance with the terms of Fairtrade regulations and better those terms, if the proceeds exist from the value chain. 5)	Finally, the biggest beneficiary from wine sales in the UK is the Government, and there should be a set aside or some similar contribution or rollback of duty in order to help sustain the FT system. Without a “contract” between all the parties in the value chain, the temptation will be for some in the chain not to participate in delivering the real meaning of the endeavour. One of the implications of "Fairtrade" is that others, who are not part of Fairtrade, trade "Less Fairly". "Fairtrade", by definition, means more cost and if everyone along the way is expecting to make the same amount, and the consumer is unwilling to pay a bit more, then the system will not work and it will be another cynical endeavour, with duplicity reigning. Let's not all just take advantage of the nice halo that Fairtrade can offer, but truly own the fundamentals of what Fairtrade stands for by everyone who benefits from the sale of the product, contributing to the betterment of others who need the help. We think that there is more to the Fairtrade discussion and we'll be posting some more on the subject. Here begins a tale of woe. Having purchased (and thoroughly enjoyed) a bottle of your fine pinotage last night [i.e. the night before the new Stormhoek promo was posted] for the first time, myself and my two colleagues (one of them happens to be my wife) decided to take you up on your challenge today and ran (literally) to the local Tesco to take our photos there. Just outside the building, my foot found its way into the hole where a brick once lived and I seriously sprained my ankle. Not only this, but the Tesco we ran to didn't have any Stormhoek! After helping me limp back to the office, my lovely wife's off to find an ankle support and some frozen peas. Heh. Check out Pete's neat website, "Your Name On Toast". We have our first winner... Thanks, Wil! I'm not sure why exactly, but I always like it when I see new Stormhoek photos on Flickr. Something kinda affirming about it. So what the heck, I was thinking, Stormhoek is now doing a wee promotion at Tesco's in UK, where a bottle is going for £3.99 [£1.00 off the usual £4.99], for the next week or two. So maybe there's an opportunity to have some fun here. 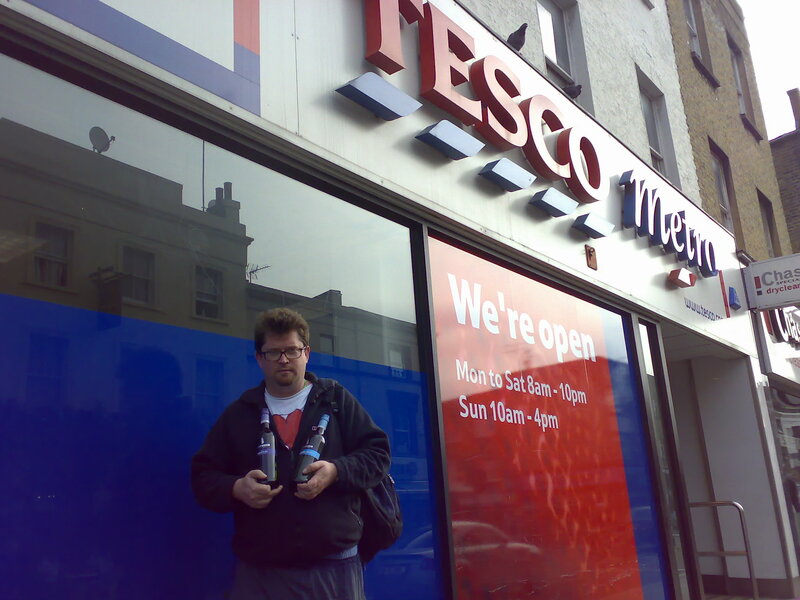 Therefore, the first 500 people, aged 18 or over, who send me a pic of themselves in Tesco's, holding a bottle of Stormhoek, will receive a £5.00 Tesco voucher from us, to cover the cost of the wine [N.B. These vouchers are not sponsored by Tesco's. We're covering the cost out of our own pocket]. And hey, you don't even have to buy the wine if you don't feel like it. You can spend the voucher on whatever you want. Nor do you have to blog it. Frankly, I'm more interested in the photos. And to make it a bit more interesting, we'll post our favorite pics on the Stormhoek blog, and each week we'll send a complimentary case of wine to the person who took our favorite picture that week. [AFTERTHOUGHT:] To get the ball rolling, I'll send a case of Stormhoek [6 bottles] to the first six people who send in a photo [on condition that you're over 18 years old, of course]. Again, you don't even have to buy the wine, nor do you have to blog it. [CAVEAT:] Though this promotion is in most Tesco stores, it isn't in all of them. If your local Tesco doesn't carry Stormhoek, apologies in advance. Drop me an e-mail if this happens and I'll see what I can do. Thanks. [P.S. For all you Wine Geeks:] The Stormhoek Pinotage that won the "Best Pinotage in The World" award last year is part of the promotion. Rock on. This might turn out to be quite groovy, it might not. Whatever. Fail fast, fail often etc. But it's a cool enough idea to make it worth a try. Feel free to send your photos to gapingvoid@gmail.com. Thanks Again.